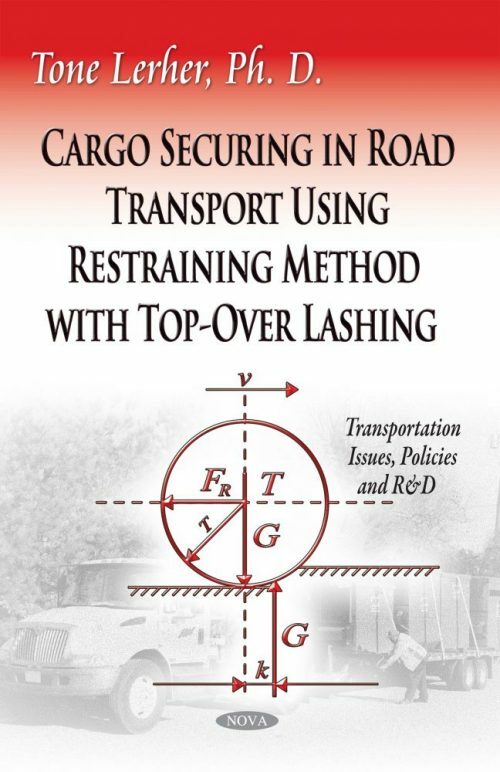 In this book, cargo securing in road transport using the restraining method with top-over lashing is presented. Cargo securing is the prevention of slipping and tipping of cargo forward, sideways and backwards, which is a consequence of hard braking, vehicle cornering in roundabout, vehicle changing lanes, high acceleration, etc. Usually, the friction alone between the cargo and the load platform bed does not guarantee that the cargo would not slip or tip in case of hard braking, vehicle cornering, vehicle changing lanes and high acceleration. In the case of hard braking, extremely large inertial force occurs, close to values of the 0.8 ∙ g, which is also confirmed in this book. Also the resting moment of the cargo does not guarantee that cargo when vehicle cornering or vehicle changing lanes, would not tip from the load platform bed. For this purpose, it is necessary to protect the cargo with an additional force, which is called the pretension force. It has been found out that the pretension force depends on several factors, like lashing angle, coefficient of friction between the cargo and the load platform bed, geometrical and actual center of gravity, etc., which is analyzed and discussed in-depth in this book.